Medium black cherry hue with a bouquet of spicy, almost cedary, with subtle fudgey notes at the edges of the glass. Big berry nose setting off the fruit potential fruit bomb. Palate--Big bold presence on the palate with big gobby dark berries, mocha, bitter chocolate, with a strange mid-palate and a smokey finish. This Boekenhoutskloof, S. African Syrah is quite different than our domestic Syrahs. It is big and bold like ours but the rest of it lets you know you're not drinking a domestic Syrah. I paid $11 for this and I'm not sure if I like it or not. It might just be better with food--we'll see. With my pairing it was indeed a better quaff; some wines are just great by themselves and others just go better with food. 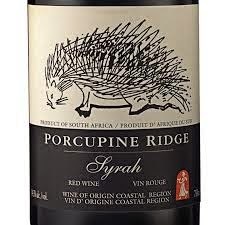 If you're in a fruit bomb kind of mood, you love Syrah and you want one with a change of pace, try the South African variety and raise a glass!